The Glen-Mor Restaurant method of using stock to boil the squash is a new preparation method for me, and adds a little depth to these summer vegetables. 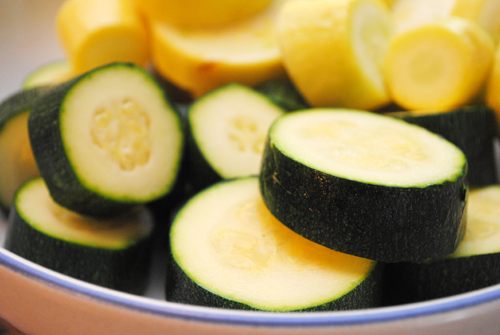 Slice squash in rounds approximately 1/4-inch thick and set aside. Bring stock and water to a boil in a large pot. Add vegetables to boiling water and cook for 5 to 7 minutes uncovered over medium heat or until vegetables are just tender when pierced with a fork. Drain liquid and keep vegetables in the pot. Add butter and stir over low heat until butter is melted and vegetables are coated. Add salt, adjusting as necessary dependent on the saltiness of the stock. Drain vegetables and serve warm as a side dish.